Early Bird Registration Deadline is Friday, August 30th, 2019. Regular Registration Deadline is Monday, October 28th, 2019. Please contact NaBITA at conference@nabita.org or 484-321-3651 for information on this event and registration inquiry. Online registration will require credit card payment. To request an invoice for a different payment method, please download a registration form(s). Registration fees reflect early bird, member and non-member pricing. No additional discounts are available, and no active coupon codes are accessible. The registration system will automatically identify if you are a member or non-member of NaBITA. Members of NaBITA are not required to sign-in to their accounts prior to registering. Early bird registration closes on Friday, August 30th, 2019. Registration cancellation forfeits training materials and any other associated promotion. 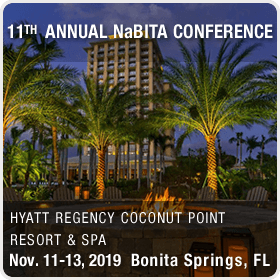 If the originally registered attendee can no longer attend the training, NABITA will allow another individual from your institution or organization to attend in your place. If you do not wish to send someone in your place, you may apply a credit in full towards the cost of a future event, membership purchase or renewal, or other purchase with NABITA. If you do not want to bank a credit with NaBITA, your registration will be refunded based on the schedule above.